[MARCH 17, 2000] Are you thinking about renting a movie tonight? I hope these reviews will help. Today I take a look at two completely different releases. 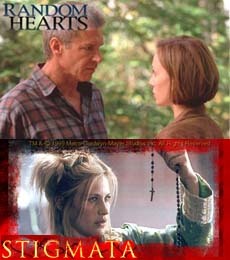 "Stigmata," starring Gabriel Byrne, Patricia Arquette and Jonathan Pryce, is a disturbing story of faith, the miraculous and the desire of the powerful to avoid truth and change. While Kristin Scott Thomas and Harrison Ford begin to uncover the mystery of their spouses' betrayal in the lengthy psycho-drama, "Random Hearts." Emden’s FFA Agriculture Sales team placed second in the Section 14 FFA Career Development Event while five Hartsburg-Emden FFA members were selected as District III Proficiency Award Winners, based on their interviews pertaining to their Supervised Agricultural Experience Program. Click below to get the details.